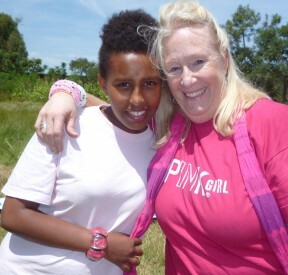 I arrived in Ethiopia at the end of September in order to lead PinkGirl into the new school year. We began in January 2011 with 15 girls and this year, 2012/13, we have exceeded 120 girls on 4 campuses. Last years success of 88% of our girls passing to the next grade has been a great encouragement. We are headed in the right direction and the Life Skills classes are changing minds and hearts. We sent 8 of our girls off to the universities. We have added 38 new 9th grade girls as well as a pilot program of 24 -7th and 8th grade girls. All of the girls are tutored in 6 academic classes and attend a Life Skills class each week. We have a partnership with YoGo Girls and Grace Center for Families and Children so that their girls are able to attend the tutoring and Life Skills classes. This article was posted in News. Bookmark the permalink. Follow comments with the RSS feed for this post.Trackbacks are closed, but you can Post a Comment.